If you haven’t already eaten this week’s delicious blueberries from Adam’s Berry Farm, we suggest trying your hand at pocket pies! With just a pint, a full pie can be a stretch - pocket pies use less but give you the same taste. Also perfect for an on-the-go snack. Two things to keep in mind while making crust are to keep everything cold, and to avoid overworking the dough. In a mixing bowl, combine two cups of flour and 1 tbs cinnamon (or other spices). If you are using butter from another producer that is unsalted, be sure to add a teaspoon or so of salt to your creation. Remove butter from the refrigerator (it must be cold!) and cut half the package into small ¼ inch cubes. Add butter to flour mixture and using a pastry cutter or fork, quickly work the butter into the dough until no large chunks remain. 1 spoonful at a time, sprinkle in the ice water. Use just enough so that the dough begins to clump together and be formed into a ball, but no more. Chill the dough - preferably for 2 hours and up to two days. Place blueberries in a small mixing bowl and toss with 2 Tbs of flour. Alternately you use cornstarch or a tapioca - this is just to get the blueberries to hold together. Add your sweetener of choice and toss until evenly distributed. Destem basil and mint leaves, chop or shred if desired, or leave whole. Place aside. Prep your area - sprinkle flour on a clean counter space. Have about a ½ cup of flour on hand to help you deal with sticky dough. Bring out a baking sheet and place it nearby so you have a place for your final product. Place the blueberries, mint and basil leaves within arms reach. Grab a small glass of water, to help you close up the edges of the pocket pies. Take out your dough and roll it out on the floured surface. Apply more flour as necessary to counter and rolling pin to keep dough from sticking. Roll out until dough is under ⅛ inch thick. Cut out 4-5 inch diameter circles from the dough. You can form a ball with the scraps, roll it out again and create more circles until you’ve used up all the dough. Place a handful of blueberries on each circle, along with a pinch of mint and basil. Fold the circle in half and press the edges together. If you are having trouble getting the edges to stick, use a pastry brush or your fingers to wet them with cool water, then seal them. Press the edges of the pies down, then, starting at one end, begin to twist along the edge to create a pretty and flaky edge. You can also press it with a fork or any variety of methods, as long as the edges seal well. Poke a couple of holes in the top of each pie to let steam out. Place finished pies on the baking pan, and bake for 12-15 minutes, or until pies are golden brown. 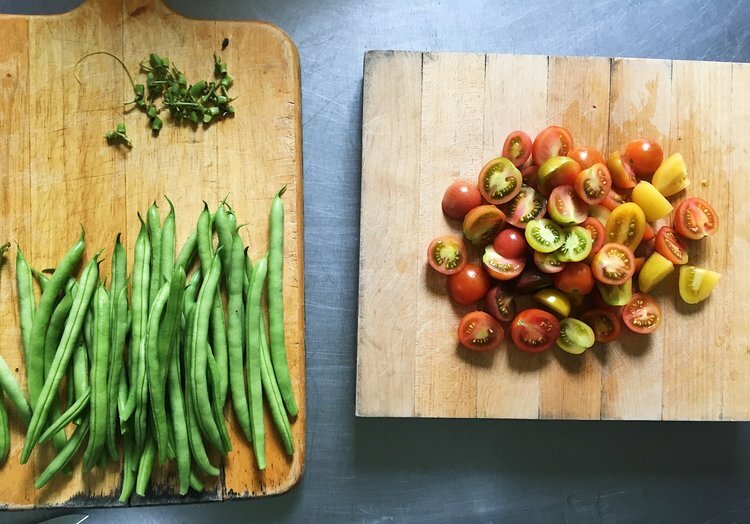 We decided to keep it simple this week by oven roasting our cherry tomatoes, green beans, squash and zucchini all together. 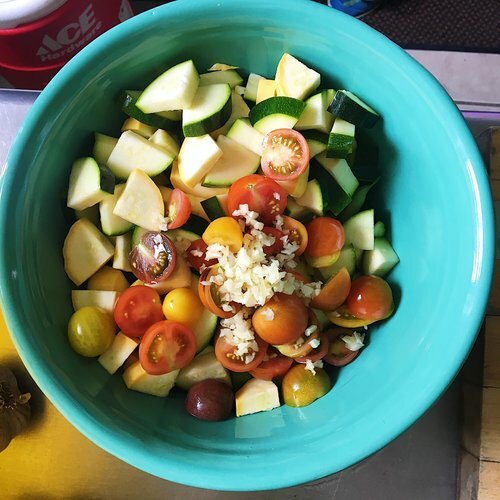 Roasted veggie combos can be eaten hot or cold, and they store well in the refrigerator and can be added to pasta, salads, or serve as side dishes all throughout the week. To give you some ideas we made a cheesy couscous dish with one half, and served the rest up with a balsamic glaze. ¾ of a pint of cherry tomatoes, halved. 1 lb bag of zucchini & squash, cubed. 2. Wash and prep all veggies, keeping sizes consistent to they will cook evenly. 3. In a mixing bowl toss veggies with garlic and olive oil, until thoroughly coated. Sprinkle salt and pepper. 4. Move veggies to large baking pan, spreading them out evenly. 5. Roast for 30-40 minutes, or until desired softness. Salt to taste. 1 cup dry (2 cups cooked) Pearl Couscous. Any other pasta or starch like rice would work well with this dish! Stir ¾ of a container of herb cheese spread into the still - warm couscous, until evenly coated. Add ½ the pan of roasted veggies. Top with additional fresh herbs like parsley, cilantro, or basil, any of your favorite spices such as rosemary or thyme, or another cheese like shredded parmesan or crumbled feta -- you can’t go wrong! Once roasted veggies are tender, drizzle them with a couple tablespoons of balsamic vinegar. Return the pan to the oven for a couple more minutes, allowing veggies to brown and vinegar to reduce. Eat plain or season with spices to your liking. 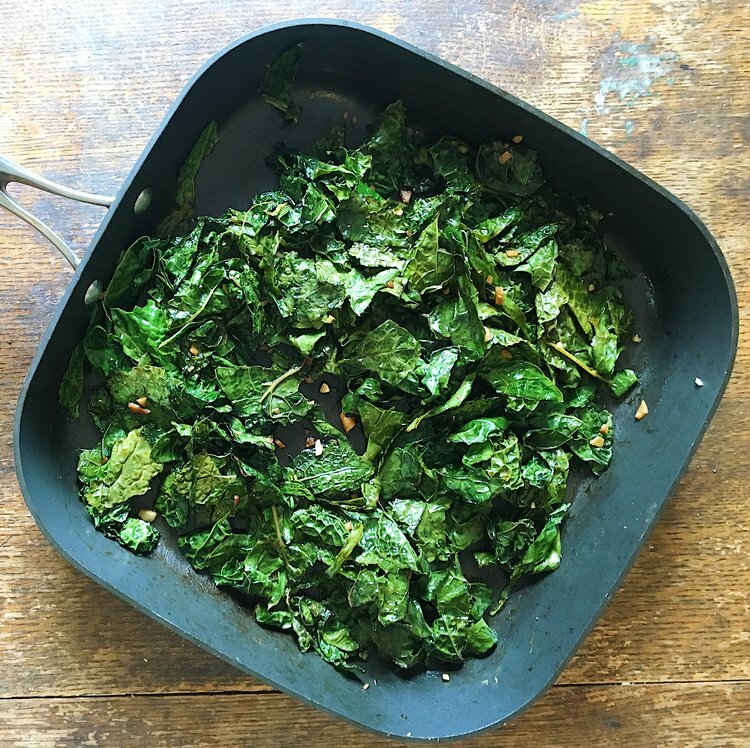 This simple combination can be eaten alone, used atop salads or as a side dish! 1 bunch Lacinato Kale, washed and stripped. Wash your kale then prep it by strippingit off the stem. Heat up olive oil in a pan, on high heat. When oil is hot, add kale. As it begins to soften, add in garlic. After 2 minutes stir in soy sauce and rice vinegar. Cook until kale is soft, but not turning brown. 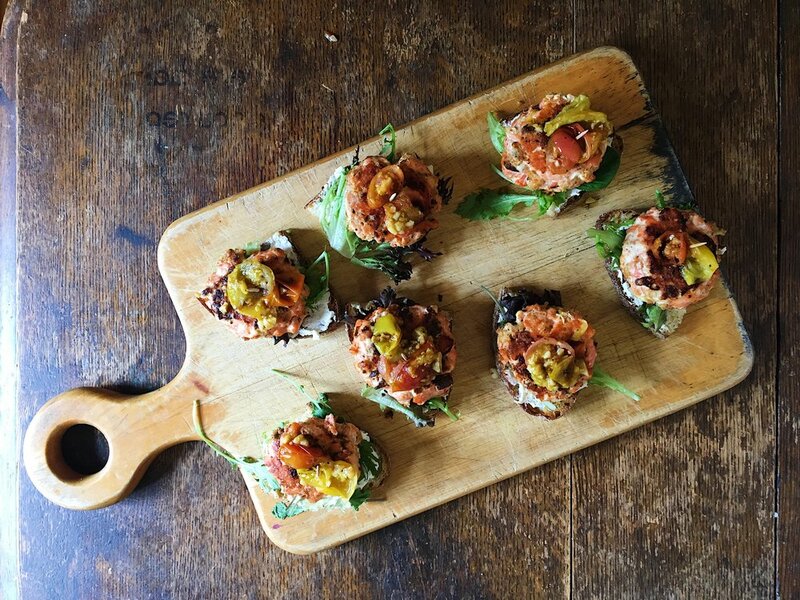 Perfect for the ground salmon in our Wild Alaskan Fish subscription this month! Though we cooked ours up on the stove, this recipe would be perfect to grill at a summer cookout. Open package, drain salmon, and place into a medium sized mixing bowl. Combine with minced garlic, egg, breadcrumbs, a tsp of salt and a pinch of pepper. Form into patties, place on a plate, and put in freezer for a few minutes while you make the relish. In a small pan, heat 1 Tbs butter. Add garlic and tomatoes and cook down until very soft and sweet tasting. Remove from heat and allow to cool. In a large pan, heat 1 Tbs butter for the sliders. Remove patties from freezer. Once the butter is bubbling, place your sliders on the pan. Cook for 3-4 minutes on each side, or until they are nicely browned on the outside and cooked all the way through. Pop a couple slices of bread into the toaster. Cut the slices of bread in half, top with bit of mesclun. Place a sliders on top, and garnish with the relish. Yum!